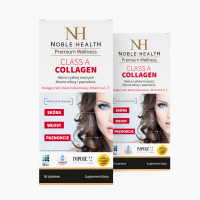 Collagen in pills Class A Collagen - Natural dermocosmetics and dietary supplements. Collagen creams. It takes care of healthy and beautiful skin and improves the appearance of hair and nails1. TAKE CARE OF YOUR APPEARANCE WITH CLASS A COLLAGEN! 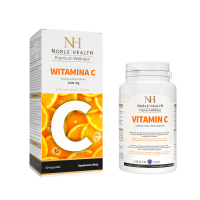 Vitamin C stimulates collagen production to ensure proper skin functions. Proanthocyanidins from grape seeds support general health and appearance of skin. Zinc participates in protein synthesis, helps maintain healthy hair, skin, and nails. The marine collagen Class A Collagen can be used by pregnant women and breastfeeding mothers. Class A Collagen has been evalueted by a toxicological and pharmacological expert report, which determined if the product can be used by pregnant women and breastfeeding mothers. The report confirmed that collagen slows skin and hair ageining as well as eliminates stretch marks and cellulite. What is more, the experts report proved that marine fish collagen has the most beneficial properties and assimilates the best. The main conclusion from the report is the fact that the product's ingredients are suitable for pregnant women and breastfeeding mothers. Collagen obtained from wild cod (Gadus morhua) skin that lives in North Atlantic Ocean. The collagen is hydrolysed and spray dried. Class A Collagen is a unique nutricosmetic composed of the highest quality ingredients. Other products that are available on the market often contain cheaper equivalents of lower quality. It’s worth to pay attention to the composition of the product since class A collagen from fish has the best effect on the body. The beneficial effect of Class A Collagen in pills has been confirmed by a test carried out at the Collegium Medicum of the Nicolaus Copernicus University in Bydgoszcz. The results of 3-month-long research have turned out to be excellent – as many as 75% of the participants have experienced increase in skin humidity and hydration. I recommend the product to every woman! 1. Who is Class A Collagen designed for? 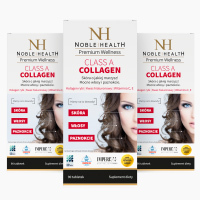 Class A Collagen is a product designed for those who wish to take care of the skin, hair and nails. The dietary supplement has been created on the basis of active ingredients, mainly class A collagen from sea fish, hyaluronic acid as well as grape seed extract. The composition and content of the Noble Health products allow to combine them and make them suitable for people of different age. The product has been tested with regard to skin and hair by the N. Copernicus University in Bydgoszcz and the results have shown, inter alia, 80% supplementation of deficient zinc in hair during a 3-month period of taking the supplement. 2. What’s the composition of Class A Collagen? Ingredients: bulking agent - microcrystalline cellulose, marine fish skin collagen, powdered protein from soya beans, potato starch, L-ascorbic acid (vitamin C), mineral mix: zinc gluconate (zinc), sodium selenate (selenium); grape seed extract (Vitis vinifera L.), anti-caking agent - magnesium salts of fatty acids, hyaluronic acid, bulking agent - hydroxypropylcellulose, anti-caking agent - silicon dioxide, DL-alpha-tocopheryl acetate (vitamin E), d-biotin (biotin). 3. What’s the effect of the ingredients of Class A Collagen? 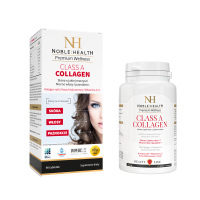 Class A Collagen takes care of healthy and beautiful skin and improves the appearance of hair and nails. It’s a supplementation of your everyday diet with selected nutrients which support proper functioning of the skin. Class A collagen from fish and vitamin C support adequate production of collagen which allows for optimal functioning of the skin thus ensuring, among other things, its healthy appearance. Proanthocyanidins from grape seeds support general health and appearance of the skin. 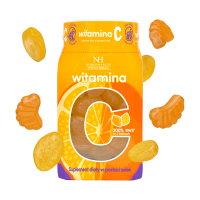 Vitamin C and E cooperate to protect the cells against oxidative stress. Zinc aids in proper synthesis of proteins and has a beneficial effect on health of hair, skin and nails. Biotin, selenium and zinc help to maintain healthy and shiny hair. 4. How to use Class A Collagen? Recommended use: 2 pills in the morning and 2 pills in the evenining, wash them down with water. Do not exceed the recommended daily dosage. Dietary supplements should not be taken as a substitute for a varied diet. A balanced way of nutrition and healthy lifestyle are key in keeping you healthy. A recommended daily dosage ensures beneficial effect on health. 5. How to store Class A Collagen? Class A Collagen should be stored at a room temperature in a dry place, out of reach of small children. 6. What’s the form of collagen in Class A Collagen? The product contains collagen in the form of hydrolysate. 7. How many pills does a package of Class A Collagen contain? 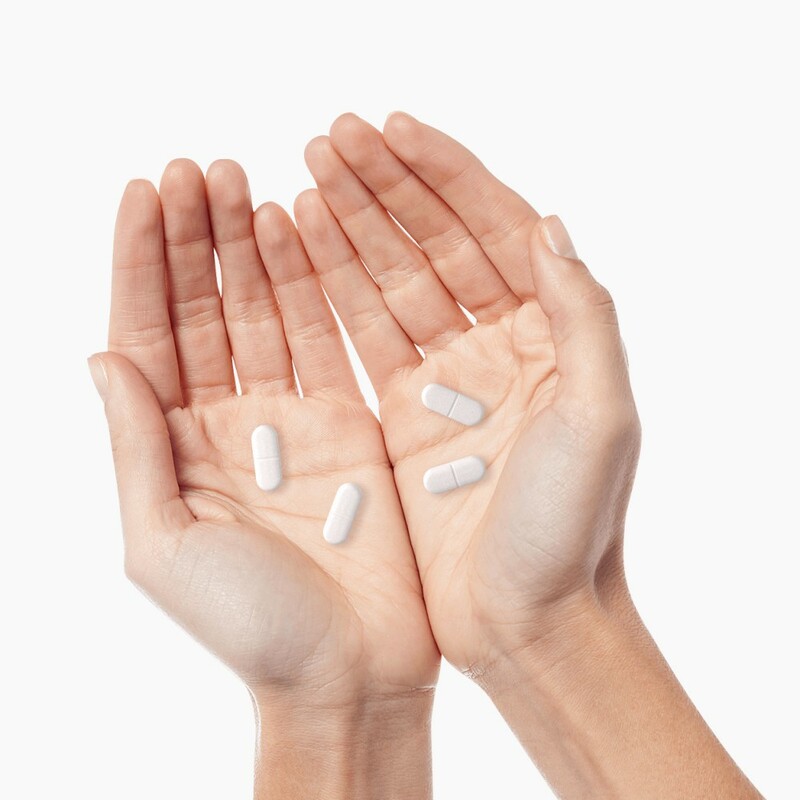 One package of Class A Collagen contains 90 pills. 8. 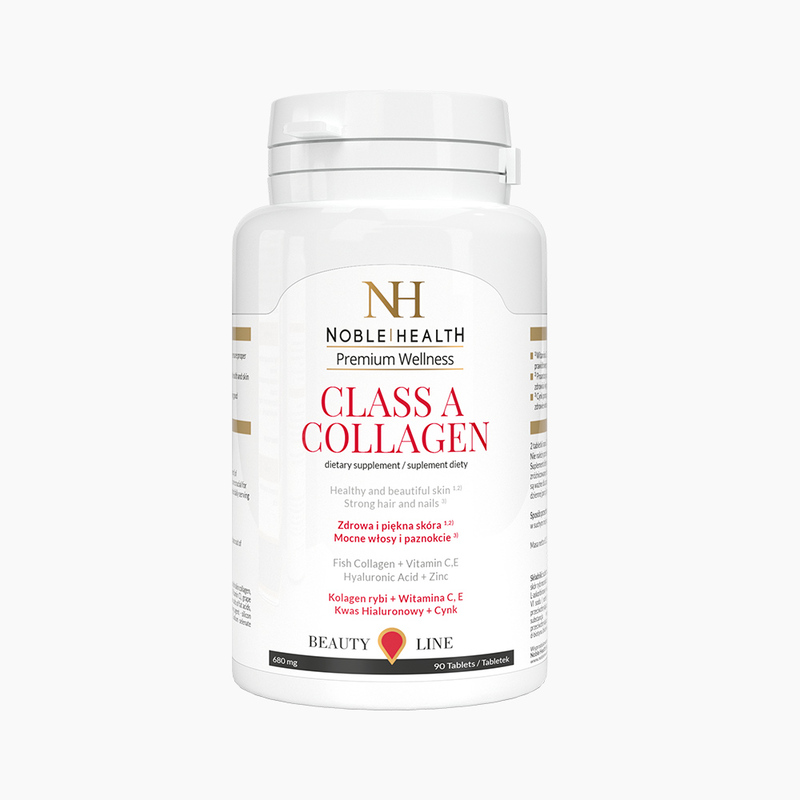 What’s a net weight of Class A Collagen? Class A Collagen has a net weight of 61.2 g.
9. Can I take the product during pregnancy or breast-feeding? Pregnancy is a special time and taking any dietary supplements should be consulted with your physician. Noble Health products can be taken after 6th month of breastfeeding. If you want to start supplementation in advance, consult your doctor. 10. What is the size of the collagen molecule in the product? The collagen molecule in the product is 4000 daltons. For me this is the number one collagen. My skin condition is better, my hair and nails are stronger as well. I am taking these tablets for two weeks now and I already see awesome changes, my skin is hydrated, discolourations are dissappearing, but most of all this product eliminates stretch marks!!!! I am recommending this product to every woman! TOPNOTCH!!! Very fast delivery!!! Thank you!!! Everything OK!!! Nice and fast contact via e-mail. HIGHLY RECOMMENDING IT!!! My skin was incredibly pleasant to touch after the first week. Regular use of the product was better than a body lotion. My hair was no longer falling out, this was a huge problem for me after pregnancy and breastfeeding. Awesome product! fantastic composition of minerals and vitamins for women. However, you have to take a lot of these pills (4 per day) but I think it is worth it. The first results are visible after 10 days. Now my skin is more flexible, looks healthier, my hair and nails are stronger and grow faster. I recommend it to everyone! I take Collagen for a very long time and I must admit that it is visible on my face. My skin is smooth, healthy and looks younger. What is more, this product strengthens joints! I have just finished the first package and with a clear conscience, I must admit that these are the best pills I've ever used ! My skin is fresh, moisturized, lifted, elastic, and has a healthy glow ! Pure benefits, everyone should use it !!! This is my favourite product when it comes to improving skin firmness, smoothness, and moisturisation. My hair and nails are also looking better. 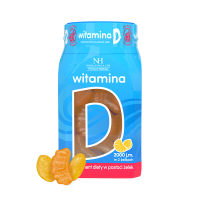 I was quite sceptical when it comes to food supplements, but my sister recommended me this product because it helped her. Well, I liked it and now I am using a second one. I am very satisfied with the results because my hair was damaged and unpleasant to touch. Now my hair, nail, and complexion are beautiful. The collages has improved the general condition of my body. In my opinion it's the best collagen for the nails and skin. As for me, the best !!!!!!!!! Using the next pack of Class A Collagen tablets, I noticed that I had much less hair fall. I'll just add that I was loosing a lot of them before. The preparation also affected the moistening of my skin and gently stretched the wrinkles. I strongly recommend the use of Class A Collagen tablets !!! After the birth of my children I couldn't get along with my skin, was constantly peeling and had a pile of pimples. I thought it was hormones. The hormonal treatment did not work, so I was looking for natural solutions. First, I started using class a collagen and then night cream. now I have complemented the treatment with a cream for the day and my skin looks great. In addition, the stretch marks are barely visible. I recommend every young mom! I use class a collagen because my daughter bought me one and really skin is completely different! I've been using Class a collagen for a long time and I do not feel free to stop now! Even if you forget your face cream, nothing happens and the skin remains moisturized, swallowing the pill is really comfortable in my busy schedule. It's the second time I've ordered cosmetics from NH, delivery super fast! 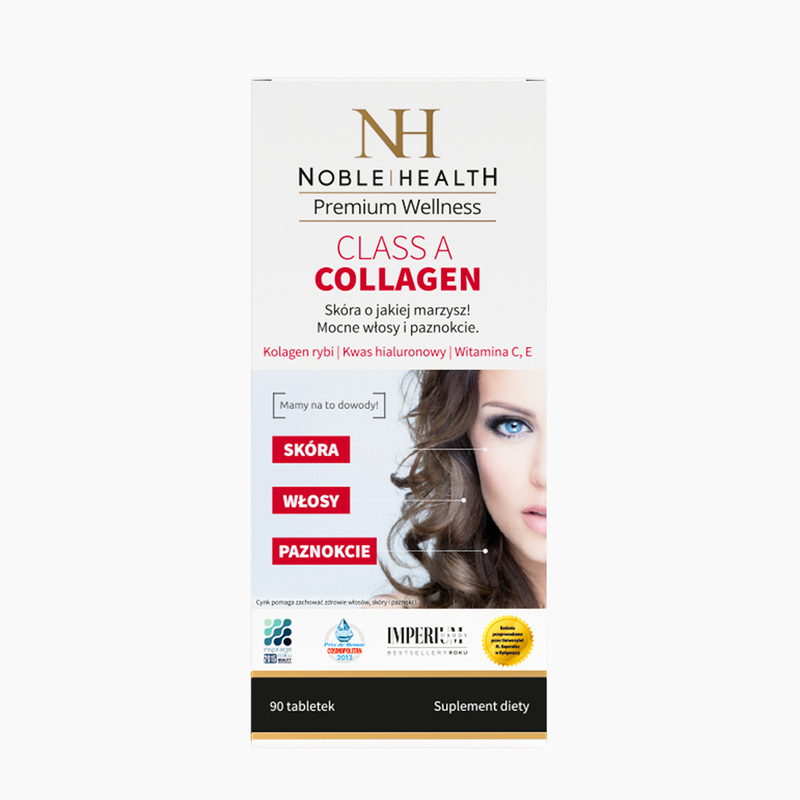 Collagen cream for the day moisturizes well, and the tablets are great for hair and nails. Waiting impatiently for other products that I'll definitely try!! I'm finishing the second packed of collagen, I am very satisfied. I was having trouble with fine wrinkles around my eyes and acne scars. I had a tendency to have dry skin. After two months my complexion is smoother and the imperfections barely visible. I look and feel better. I often hear compliments from loved ones that I "rejuvenated" ... I know that the Class A Collagen kit was the best investment. I will definitely go back to it. I recommend to all !!! Wonderful pills, I'm glad I came across them. My hair and nails have definitely improved my condition, and my skin does not even mention it, the effect is sensational! I'm a little concerned about the size of the tablet, but overall I was getting bigger. Important that it works. Thank you for such a product! Hi Noble Health, I've decided to write to you, because recently (3 weeks) I'm using your product. Dry skin has always been my eternal problem, and it was so dry that I could draw on it, also if soon after washing I did not apply the cream, it pulled as if it was a bit tight. I am already 35 years old :/ and wrinkles have appeared, although looking at my friends, and so I think, there is no tragedy. Well, I'm writting, because I am amazed by the affectivness of your product, the skin is not dry, the wrinkles are kind of smaller, and as even the bumps appear from the pillow during the sleep, it somehow disappears so quickly. I never knew I had a problem with excessive hair loss, but now there is almost no hair on the bathroom's floor. Thank you very much for the professional product that you deliver to the market.